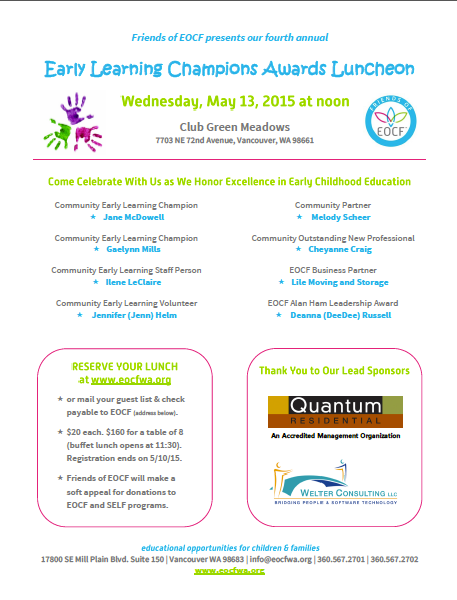 Welter Consulting is proud to be co-sponsor of the Friends of EOFC 4th Annual Early Learning Champions Award Luncheon. The event will honor eight Early Childhood Education Champions at a luncheon at Club Green Meadows on Wednesday, May 13. Educational Opportunities for Children and Families (EOCF) has grown to become the leading provider of comprehensive early childhood education and family support programs in Southwest Washington. EOCF is one of the largest social service organizations in Southwest Washington and is the second largest nonprofit organization in Clark County with an annual operating budget of $10.5 million and approximately 265 employees. EOCF serves more than 2,000 children and families, most of whom are low-income. Areas served include Clark County, Pacific County, and the Woodland portion of Cowlitz County. We congratulate all of the champions who have dedicated their time and energy to worthy goals of Early Learning – and we are proud to sponsor this event honoring their achievement. Here are the slides from the Nonprofit Enrichment Series presentation ‘Quarterly Payroll Reconciliation: Key Steps to Ensure W2/W3’s are Accurate’ that was held on April 9, 2015. Be sure to join us for future sessions of the Nonprofit Enrichment Series. Scroll down for form to download Excel templates. We’ve scheduled 2015 Abila MIP Fund Accounting Classroom training in May and June! Abila MIP Fund Accounting Classroom training offered in Seattle (Kirkland) area at the premier training facility in the area. Learn best practices of your MIP Fund accounting system by taking classroom training from a CPA and Certified Trainer. Please contact Vicki Welter (vicki@welter-consulting.com or 206-605-3113) if you have any questions or need additional information to determine what training class(es) are best for you. · Individual workstation and class materials are provided for each student. · Minimum of 4 attendees to hold each class. As soon as the minimum attendance is met, you will receive confirmation by email and will be invoiced at that time. · Out of town guests should wait to book travel until class is confirmed. Contact us for a list of nearby hotels/restaurants. · Cancellation must be done 2+ weeks prior to class date for full refund.